Welcome back! I'm so glad you could join the Stampin' Up! Artisan Design Team for our next blog hop of July! 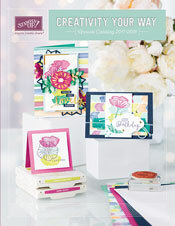 Today we are featuring our projects which use several new products from the 2013-2014 Stampin' Up Annual Catalog! You might have just arrived from Jeanna’s blog. If not, make sure you go all the way around the hop to get to her card! Today I have a card to share. I had a lot of fun making this card. It sort of just came together, and I love the shabby feel of it. Sometimes I can't pull off this look, but I think I did so this time! I started with a 5"x5" square of Very Vanilla cardstock. I stamped the Dictionary Clear Mount Stamp in Basic Grey. I just inked those corners of the stamp one at a time, and stamped it in the upper left and lower right corners respectively. Then, I stamped the Delicate Doilies Clear Mount Stamps in Versamark over the same areas, embossed with clear embossing powder and then sponged on some Pistachio Pudding Ink. I also splattered some Crushed Curry with my Aquabrush onto the stamped piece. This was mounted to a Basic Black card. For the focal point, I colored one of the frames from the Label Love Clear Mount Stamp set with a Crushed Curry marker, and then punched it out using the Artisan Label Punch. I used the Stamp-a-ma-jig to place the greeting stamp in the middle in Jet Black Stazon ink. I cut the new Vanilla Coaster Board into a 1 3/4" circle, and then sponged the edge with Pistachio Pudding ink. I used a strip of Designer Series Paper from the Modern Medley Designer Series Paper, a piece of the Crushed Curry 3/4" Chevron Ribbon, which I folded over on top of a piece of Sticky Strip. I also added one of the In Color Boutique Details in Pistachio Pudding for the final touch. The greeting is adhered to the card front with Stampin' Dimensionals. Here is another close-up view of the details. I love the clear emboss resist technique that I used here, and have to remember to try that again in the near future!